Very nicely done. The scan doesn't look grainy at all and I love the blurry birds in front of Sora. Keep up the good work! >>> This's one of the best pix of KH i've ever seen! >>> & all the birds looks so alive! you did a good job in the composition of the whole thing, and before I saw it in full view I was thinking it was gonna be really cool, and well at the end it was, it was cool however as you said the resolution cut my nerves, if it was bigger the stain glass would probably look better, more detail-ish, more beautiful, little stuff you know...but important in some point... leaving that behind I like it. 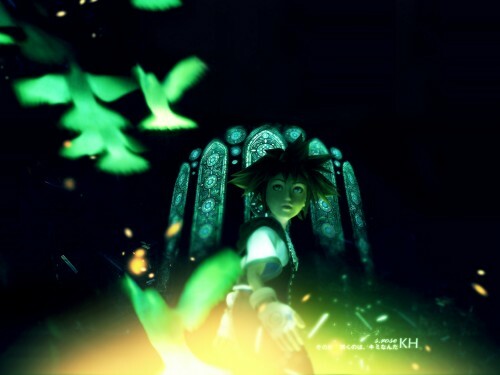 I am making a Windows Seven KH Theme, so, thank you for this wallpaper! this is amazng! thank you for sharing~!